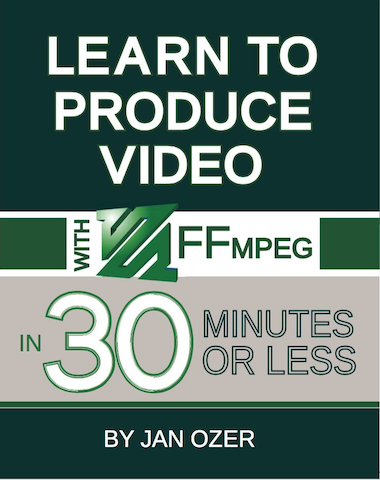 This focused 120-page book teaches readers how to use FFmpeg to create full adaptive bitrate ladders and package them into HLS or DASH formats. The book also includes a primer on terms and technologies related to streaming and recommended settings for all parameters detailed in the book. Video Encoding by the Numbers teaches you to optimize the quality and efficiency of your streaming video by objectively detailing the impact of critical configuration options with industry-standard quality metrics like PSNR and SSIMplus. This takes the guesswork out of most encoding decisions and allows readers to achieve the optimal quality/data rate tradeoff. Much, but not all of this book has been superseded by Jan Ozer’s new book, Video Encoding by the Numbers:Eliminate the Guesswork from Your Streaming Video (2017). Specifically, the new book deeply examines encoding parameters for H.264, VP9, and HEVC, as well as ABR streaming in HLS and DASH formats. However, the new book does not cover distribution, choosing an encoder or live production at all, so if you’re seeking help with these activities, you’ll find this book more useful. While webinars and video conferencing can be fabulous business tools, you have to look and sound professional to achieve the desired result. This book will teach you how.